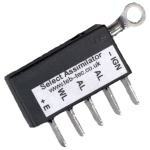 The Select Assimilator is a direct replacement for the Norton electronic black plastic unit used on the Mk III. The new unit is smaller, but maintains the same fixing position and connections as the original. It is even possible to fit the new part into the original assimilator casing … please contact us for details. Extra electronics provides an automatic current limit to the warning lamp circuit. Quality FR4 'fibreglass' printed circuit board. A high specification epoxy potting compound is used as an environmental seal and makes the assembly vibration resistant. The unit may also be used to replace the earlier Lucas 3AW warning light assimilator as used on the Mk I and Mk IIA Nortons, provided the wiring is re-arranged as detailed in the table below. The unit may also be used with any RM21 or similar (12V +Earth) alternator system. If there is any doubt please contact us. More information on original assimilators is available the NOC web-site. The lamp will illuminate when the ignition is on and will extinguish when the engine has started and the alternator voltage rises above that of the battery.